It’s always fun to do a family portrait when there’s a prop involved. Julie brought along five different black photo frames for our session which was part of mom and dad’s 50th wedding anniversary down at Salty’s. Smiles and silliness ensued. I love small, intimate weddings. Especially when they involve the not so traditonal locations…like the Arboretum at the college and Marination Station on Alki! Jennifer and James were a hoot and provided non-stop love and laughter all during the wedding. See what I mean…. 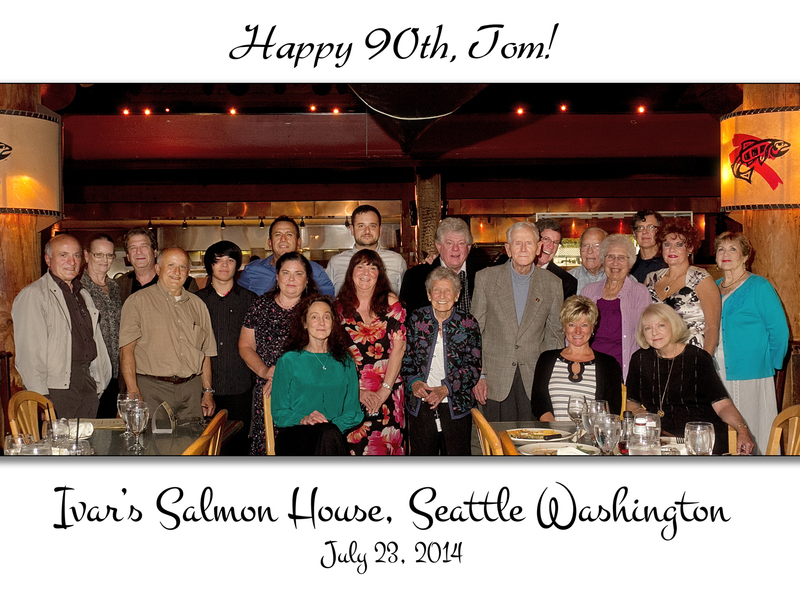 What do you give the guy who is celebrating his 90th Birthday!? How about a family reunion! Claudine called to arrange for a family photo of all the guests who came from near and far to celebrate this grand milestone for Tom. They gathered at Ivar’s Salmon House for a tasty dinner and lots of chit-chat; some not having seen each other in 30 years! What a special way to celebrate. I hope I have enough stamina to make it to my 90th Birthday!